A poison sumac tree growing on your property is often cause for great alarm and concern. The poisonous oils contained in these shrubs or trees are powerful enough to cause severe reactions in many people. Every part of poison sumac is poisonous, and the irritating oils can live on tools, gloves and even dead plants for years. An effective way to kill a poison sumac tree is to use a brush killer that will seep into the soil and kill the roots of the plant. Put on protective clothing before you begin working with the poison sumac tree and the brush killer chemical. This includes long pants, longs sleeves, boots and gloves. 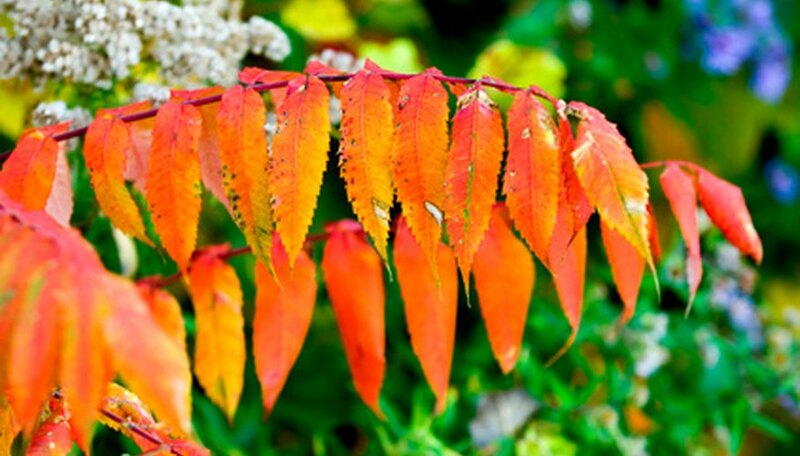 Choose a warm, sunny day—spring is the most effective time for killing a poison sumac tree. Spray or pour the brush killer directly around the soil of the sumac tree to allow the brush killer to soak into the soil. Allow six weeks for the brush killer to have obvious effects on the poison sumac tree. You should notice the tree suffering and withering after several weeks elapse, and the tree should be completely dead six weeks after you begin treatment. Remove the tree from the soil after it dies. Dig the tree up if the tree is small enough. If it is too large to dig up, attach a chain to the trunk and pull the tree from the soil with a truck. Dispose of every piece of the tree in the lawn and leaf disposal bag. Clean all clothing and tools with the urushiol cleanser. This cleanser will remove the poisonous oil from objects you use while removing these plants. Saturate a rag with the cleanser and wipe down all tools you used (drill, drill bit, handsaw and chain, for example). Wash the tools in regular hand soap and water to rinse away the cleanser. Place your clothing into a large bucket and add the cleanser and water. Soak your clothing for 10 minutes, rinse and then launder the clothing using hot water and detergent. If the poison sumac tree is small enough, cut it down with a handsaw first. Use utmost care while handling and touching every part of the tree. Cut the tree into small pieces and discard the pieces into large leaf disposal bags. Once you have removed the entire tree and only a stump remains, paint the stump generously with the brush killer to kill the roots beneath the soil. Consider injecting the brush killer into the tree. Insert the drill bit into the drill and drill four or five holes into the trunk of the tree with the drill. Apply the brush killer over the holes so the brush killer enters the holes and enters the poison sumac tree's system. Follow all directions on the brush killer label carefully. Do not burn the remains of a poison sumac tree. The oils will become airborne and could be very dangerous.